Phil suggested that we do a small scramble the other evening. We probably started a bit late in the evening, 7 pm, so we ended up at the summit about 9 pm. The winds were cool on top but the ridge was dry and clear. Our descent was partially in the dark so we used head lamps. Seems it is more than true. Climbing the stairs of 2 Overlea Blvd doesn’t quite give you the same feeling, and I’m only on the 3rd floor! 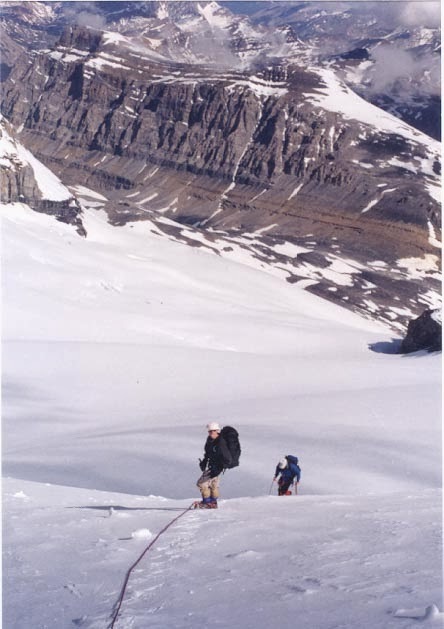 This was the first time I slept on the mountain – a bit of a hike up to Mount Hector and we needed the full second day to complete the summit and get down off the mountain before dark. This was the first time I saw someone fall through a snow bridge. Mike disappeared up to his shoulders 5 minutes after we stepped on to the glacier. No pictures of that event but it did remind me that mountains are quite unforgiving. You’ll see by the photo that Phil is quite young but he worked hard and never complained. So what do you do on a summer’s afternoon? Maybe lie on the beach or stroll through the shade of a park? Maybe you like to make your way to the local ice cream shop? And then there’s Phil who likes to climb on to a glacier and play in the remaining snow atop a peak in the Rockies! Why does he like to do this? 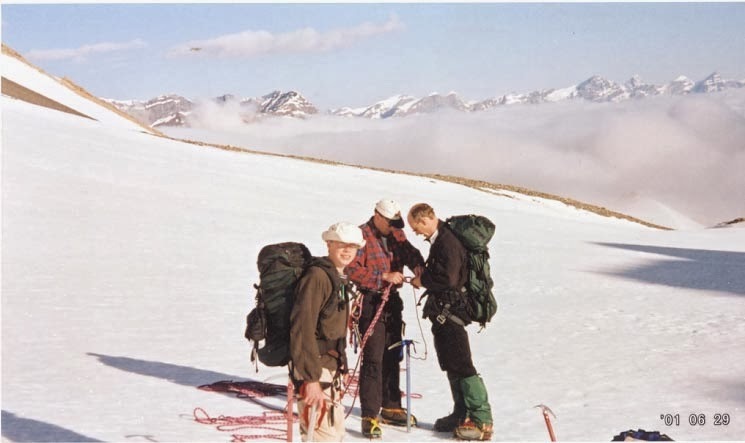 Well we could thank Tom and Mike for the introduction to the mountains in 2001 when Phil and I went with a group they led up Mount Rundle. We thought we were going to die before we got down…more from bleeding feet than anything else, but we learned and Phil has loved it ever since. I expect one day to see a photo like this with Amanda and Carlyle right beside him.